"Having been a newsboy in Milwaukee and living among them in New York, if affords me great pleasure to give the newsboys of Buffalo a show and at the same time impress them that loyalty will put them at the top of the ladder of success regardless of what professiona they may choose as their life's work." The show was held at the Shubert-Teck Theater where Houdini was playing the first season of his 3 Shows In One. The Buffalo Evening News gave a remarkable account of the show that provides what might be the best description of Houdini's stage magic, right down to some of his patter. In fact, it's so good, I thought it worth reproducing in full below. How many tricks can you identify by name? The Teck theater was filled to capacity Saturday morning when the curtain went up for a special two hour entertainment which Harry Houdini, world famous mystifier, psychic Investigator and wizard of escape, is giving for the of boys who carry the Evening News. Admission was by ticket only, distributed to the youngsters Thursday through district agents of the News. Long before the scheduled opening of the theater doors at 8:30 o'clock, Main street in front of the theater was packed with the carriers, all eagerly awaiting one of the biggest treats of their lives. Houdini's program was prepared especially for the newsboys. More than 28 feats of baffling magic were performed in addition to the manipulation of ordinary playing cards and sleight-of-hand in the tying and untying of knots in scarfs and streamers of silk, satin and other materials. His opening feat was to transfer back and forth eight French coins from an ordinary water glass to a crystal cabinet suspended in midair. The glass stood on a table in full view of the audience. The boys thought it was great and applauded enthusiastically. Then Houdini caused a lighted lamp with a flimsy shade to vanish from one table, and re-appear, still lighted, on another stand on the opposite side of the stage. He caused a large stand of artificial flowers to be transferred from a solid pot of pewter to a crystal bowl of water. From Pandora's box he brought forth a live rabbit, which he told the boys laid all the Easter eggs, then he made the bunny disappear before their eyes. A live rooster, which crowed lustily, was produced from an apparently empty tin pan and then made to disappear from a solid wooden cabinet. Large bowls filled with water in which goldfish swam, were produced and whisked away. Pigeons fluttered from a picture frame on which only tissue paper was fixed. He changed a colored handkerchief from one water decanter to another. He did all manner of sleight-of-hand tricks with knots in kerchiefs, scarfs, etc. One of his tricks was designed only this week for the special entertainment. He called it Noah's ark and caused figures to shift from one cylinder to another without being seen and without touching them. Then, from the ark which a moment before had been empty, a live pigeon appeared. From a huge, solid funnel, he made a pretty young girl disappear. In her place a huge bush of flowers appeared. He showed them Dr. Linn's [sic] trick, which he said was 78 years old. It was the apparent dismemberment of a human form in full view of the audience. Houdini next cut a long strand of cheese cloth and burned the ends. But when the youngsters who assisted him in the trick pulled the cheese cloth straight again there was no sign of a cut or of the burning. He changed a big wooden dice from a hat to a box and back again and then caused it to vanish. He tied two thongs about his neck—so tightly he appeared to be choking—but when youngsters pulled opposite ends, the bands slipped from his throat. One of the most popular of his tricks was performed with an ordinary appearing oven pan He showed it empty, covered it a fraction of a second with its own solid metal top, removed the top and it was filled with a peck of candy kisses, which he tossed into the auditorium to his guests. He made a pretty girl appear in a radio cabinet, where only a moment before there were nothing but wires and coils and tubes. For a finale, he drew from a small crystal bowl of colored water hundreds of yards of silken streamers and lastly a string of flags of all nations—enough that when folded and packed tightly would fill and ordinary wardrobe trunk. Notice there is no mention of the vanishing elephant, so this helps debunk earlier reports that Houdini was featuring this famous effect at the Shubert-Teck. 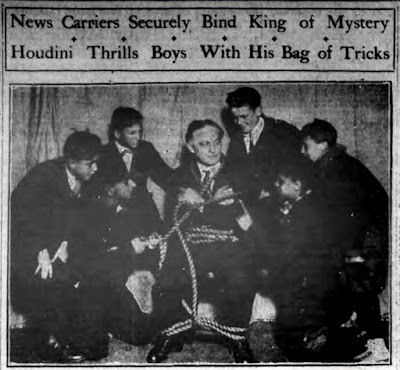 And even though the article has a terrific photo of Houdini being bound by the newsboys (above), it sounds like this was a magic only show. Thanks to Gary Hunt of Magic Footnotes for sharing this find. Wow! It was part One of his show 3 in 1 show with extras. I noticed Gwynne's Vanishing Rooster, Radio 1950, Houdin's Crystal Casket, and Dr. Lynn's Palingenesia, but that's a fraction of the show. Was Dorothy the pretty girl in the radio cabinet? Dorothy probably was for this performance. I believe she joined the the 1925 season and left before HH embarked on his last tour. Most likely she bailed out by the summer of 1926 when Harry took a few months off before his 3 in 1 show in September.